Any pizza lover knows that, contrary to what we would like to believe – not all pizzas are created equal. There are many methods for preparing this simple-yet-magnificent food, starting from pizza made from half a pita, a heated store-bought frozen pizza, all the way to high-end oven-baked pizzas, made with springy dough that is tossed in the air. Pizza can come with a large variety of toppings, but what really separates one pizza from another is the baking process. Here, there are also a number of options, beginning with the simplest heating option, of using a microwave, for those who are lazy or in a hurry, up to the baking stone used by foodies and pros. Theoretical physicists Andrey Varlamov and Andreas Glatz have recently joined forces with Italian food anthropologist Sergio Grasso, aka "The Gastrosopher," to study the physics of the baking process. For instance, what are the differences between baking a pizza in a domestic metal oven and baking it in a traditional stone wood-fired oven? And what is the actual difference between pizzeria-made pizzas and homemade ones? The main physical process occurring during baking is heat transmission: the oven's heat is transmitted to the pizza through the oven plate and the air. 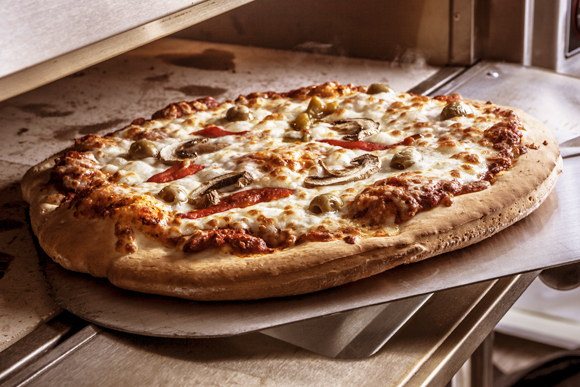 Three main layers are involved in the process: the oven's surface (stone or metal), the dough, and the toppings. The second law of thermodynamics states that heat always flows spontaneously from a hot body to a colder one. The amount and speed of transmitted heat is determined by two properties of the bodies involved: their heat capacity and thermal conductivity. The specific heat capacity of a body is the amount of heat required to raise the temperature of a body by one degree. For instance, one kilocalorie is required to heat one liter of water by one degree, but heating the same amount of aluminum requires about one fifth of that, since its heat capacity is lower. Thermal conductivity is the property of a material to conduct heat. Metals, for instance, are good heat transmitters, and therefore pots are usually made of metal that conducts the heat of the flame uniformly to the entire pot. Stone and wood, in contrast, transmit heat more slowly, so in stone and wood surfaces, it is possible to find one side of the surface hot, while the other is colder. The researchers used a simplified model to describe heat transmission and conductivity throughout different oven parts. Comparing a stone oven to a metal one heated to 330 degrees Celsius, they found that the temperature of the interface between a fresh pizza and the oven was 208 degrees in the stone oven, but 300 degrees in the metal oven. The difference stems from the metal's heat conductivity and high density. This would cause the pizza in the metal oven to burn. The solution to this seems simple – decrease the temperature in the domestic oven to 230 degrees to achieve the same interface temperature. This is where another heating mechanism comes into play – heating by radiation. Hot bodies emit a type of electromagnetic radiation called black-body radiation. The sun, for instance, emits yellowish light, a hot metal would emit red/orange light, and the human body emits infrared radiation. When we put a pizza into a hot oven, it absorbs radiation from the oven walls around it, and emits some of it back. The researchers calculated the absorbed and emitted heat, took into account the heat required for evaporating the water in the pizza dough and some of the other ingredients (tomato sauce for example), and showed that baking a thin-crust pizza in a stone oven takes 125 seconds. In contrast, baking it in a domestic metal oven takes 170 seconds, providing the temperature at the pizza-oven surface interface is the same. For the home baker, 35 extra seconds is no reason to fret, but for a pizzeria, this would mean extending the baking time by 30% – not to be taken lightly during busy hours. Either way, it appears that a good pizza can also be baked using simple means, once the physics of heat transmission are understood. It is also quite possible that a stone oven has additional contributions beyond the different heat transmission, but these are beyond the scope of this article. One final tip – to prevent the bottom of the pizza from burning and allow its top to continue baking when piled with toppings and vegetables, place it on a rack. This will keep it off the oven floor, and allow radiation to do its job.